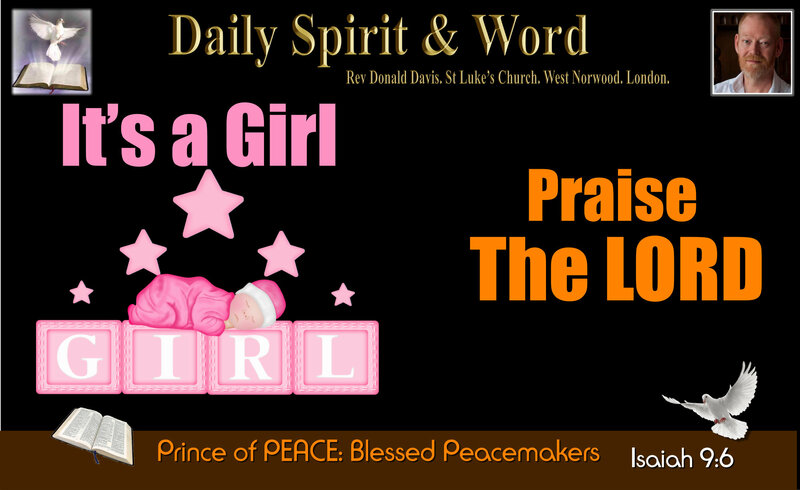 Daily Spirit & Word: 691: A Baby Girl Is Given. Praise the LORD! Praise The LORD! We’re grandparents again, little Jasmine was born at 4.00am, I was at home and woken at 4.10am by my wife, Julie, who attended my daughter. They must both be completely exhausted, because Stephanie went into hospital (May Day) on Saturday morning. She’s called the baby Jasmine (Jazmin)… I don’t know how she’s spelling it yet 🙂 When my wife phoned they still hadn’t weighed the baby. I’ll let you know later. GREAT NEWS! It’s always GREAT NEWS when a child is born, it was the same with our Lord Jesus, but did you know my friends, that His Birth was announced hundreds of years before it took place. God had been so excited that He told His Prophets the Good News many years in advance: He told them where and how He’d be born; In Bethlehem, by a Virgin, but God the Father didn’t stop there, He also told us what His SON (The Son of God) would be like. Isaiah 9:6 (ANIV) For to us a child is born, to us a son is given, and the government will be on his shoulders. And he will be called Wonderful Counsellor, Mighty God, Everlasting Father, Prince of Peace. Do you know my friends, yesterday in our Gathering at St Luke’s was fantastic. Heaven broke out amongst us. A word was given and people began to respond. The message about BEING LIGHT to those who live in DARKNESS touched so many. Now, I believe the LORD has given me a message in the night, He wants there to be a BREAKTHROUGH for someone in the area of BEING PEACEMAKERS. Do you know our Lord Jesus Christ is the great PEACEMAKER: Through His life, death, resurrection and ascension He’s bringing PEACE between men, women and children and Father God. Jesus is; wonderful counsellor, Mighty God, Everlasting Father and PRINCE OF PEACE. (KING OF PEACE). Now Jesus wants YOU to be, with His Holy Spirit within you: PEACEMAKERS. Imagine your HOME: Full of PEACE. Imagine your WORKPLACE: Full of PEACE. Imagine your NEIGHBOURHOOD: Full of PEACE. Imagine your Church of Fellowship: Full of the PEACE of the LORD. YOU will be BLESSED if you walk in this my friends: BE A PEACEMAKER. Someone asked me the other day, “Why doesn’t God just make war cease and people stop killing each other?”… I responded, “Why doesn’t God stop you, lying, stealing, cheating, etc?” He hasn’t made us robots to obey His Commands mindlessly, nor is He going to use force to make us GOOD. He wants us to respond FREELY to live according to His will. However, He’s also promised us great BLESSINGS when we do. Also, why would God do a job He’s called us to do? He also gave us a promise if we do it, we’ll be BLESSED ourselves if we are actively pursuing PEACE in every area of our lives. If there is any area in your life that you need peace today, broken-down relationships. Is there someone in your life who’s been offended by you? Then as far as possible BE a PEACEMAKER. I know it’s very difficult, especially if people don’t want to be at PEACE. Yesterday, we had a man in church who thought he’d been locked-out last Tuesday night. He wasn’t, but the main door of the church was sticking so much that he couldn’t pull it open. He thought that we’d locked him out on purpose. He came into church on Sunday full of anger about it and shouted and raged at the top of his voice, “Why did you lock me out?” After a while he calmed down and I said, “Carl, the door is sticking and it’s difficult to pull open, we did not lock you out”… His whole demeanour changed when I assured him that we’d never lock him out. He’d been seething in anger since Tuesday night and it was Sunday. I think I might be a little bit upset if I felt someone had locked me out on purpose don’t you? Anyway, as PEACE was restored, he was back to his normal self again. However, can you see why the Word of God tells us “Don’t let the sun go down on your anger”? If we do, all we’ll get it bitter. My friends, I knew I hadn’t locked Carl out of Church, but if I’d not gone to him and explained, he may still be angry today. Go out of your way to BE A PEACEMAKER. Even if you are being wrongly accused of something. I know the Bible says PRINCE OF PEACE, but did you know that when the Bible used PRINCE here, it did not mean the next in line to the Throne. Jesus is a Prince like King Henry VIII was Prince of England. Like King Louis the Thirteenth of France: They are often referred to as Princes, but Jesus is the PRINCE: The KING of Kings and PRINCE of Princes. With Jesus are your PRINCE of PEACE: He’s living in you, then your Spiritual nature will be crying out for you to be like Him. He wants you to do what He did: Bring PEACE everywhere you go. There will be an atmosphere of PEACE in your life. Jesus is the SON of God, but you too are sons and daughters of God: I think what the LORD is saying today is: “If you want to see PEACE in this world, you can be peacemakers, let it start with you, your home, you own life and soon you’ll see PEACE in many different places around this world, because PEACE spreads PEACE”…. Have an AWESOME Peace-filled week my friends. Thank you all my friends, who’ve been praying for Stephanie and her long wait for the delivery of baby Jasmine. Please continue to pray for her recovery. We’re praising the Lord. Aminata just came into my study and her face was a picture when I told her that baby Jasmine was born… There’s nothing like being the BIG sister… She’s full of it now… JOY!